This can be an appetizer, snack, or base of a meal. 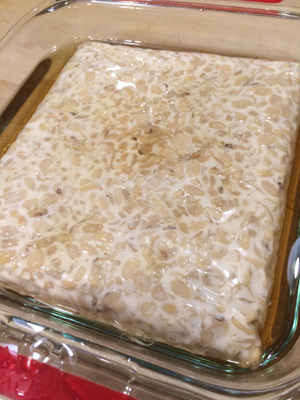 You slice the tempeh between 1/4-3/8 inch thick and fry in a high heat oil until nicely browned. 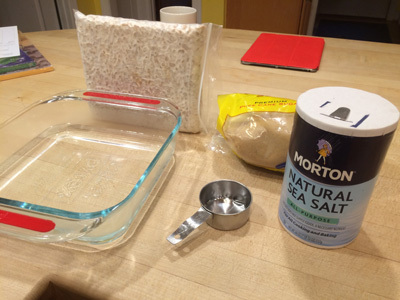 I highly recommend brining as a way to get moisture into the tempeh so it doesn't soak up too much oil while cooking. Serve it up with a condiment of your choice. 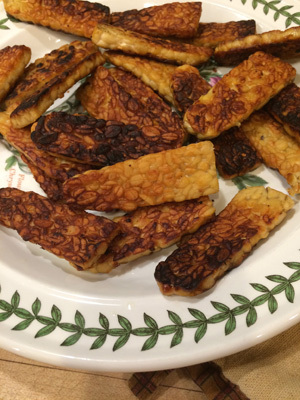 Fried is such a good way to introduce people to the mild, nutty flavor and meaty texture of tempeh. We love it with hot wing sauce and on top of a big salad. We also love it in tacos, quiches, ramen and sandwiches!